While the warm winter season has seemed odd to many of us, it’s been a great boon for some of Corvallis’ root vegetables—including some more unusual species trans-located here from South America’s Andes Mountain regions. Armed with a prolific harvest of these new-to-us Andean tubers, Dylana Kapuler and Mario DiBenedetto, founders of local organic seed suppliers, growers and breeders, Peace Seedlings, are in the process of introducing significantly greater variety into our local diet—a movement they hope will be perpetuated throughout the Pacific Northwest and beyond. 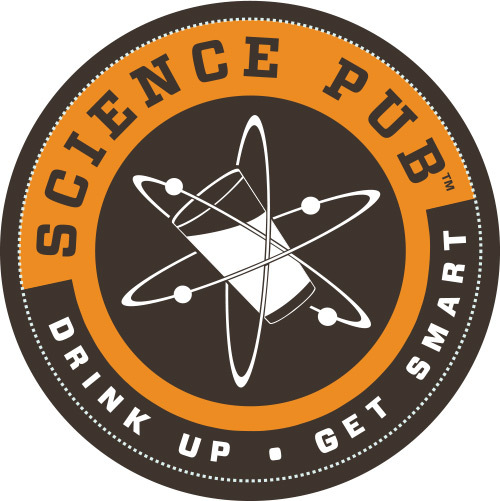 From left to right, Dylana Kapuler, Mario DiBenedetto, Linda Kapuler, Alan Kapuler. Peace Seedlings is a second-generation Corvallis company, evolved from Peace Seeds, started by Dr. Alan Kapuler and his wife Linda. 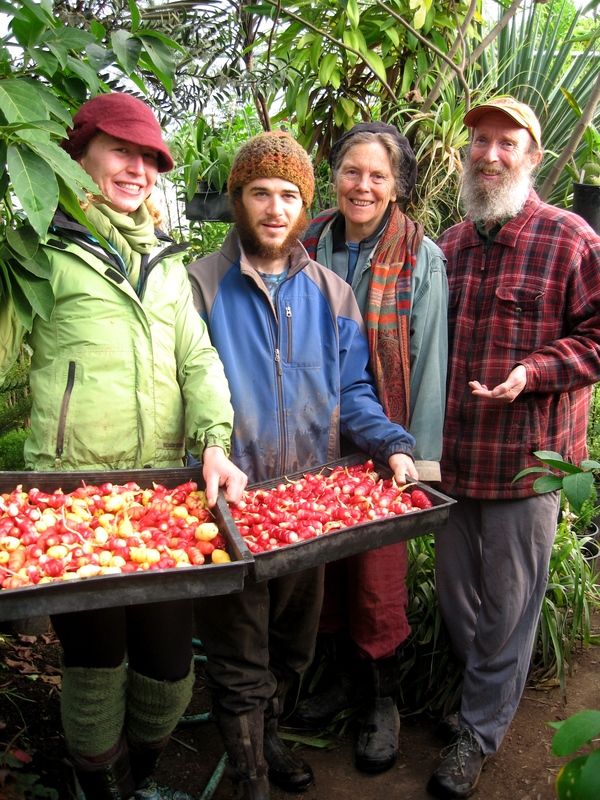 Peace Seeds was born when the couple began replanting the seeds from their expansive garden each year. Their seed collection now contains 10,000 to 15,000 samples, many grown in their own plots, and some the product of wildcrafting, or collecting seeds from the natural world. Peace Seedlings, like Peace Seeds, employs entirely organic cultivation and collection methods, including composting, crop rotation, biodiversity in planting, and a complete avoidance of synthetics and poisons. 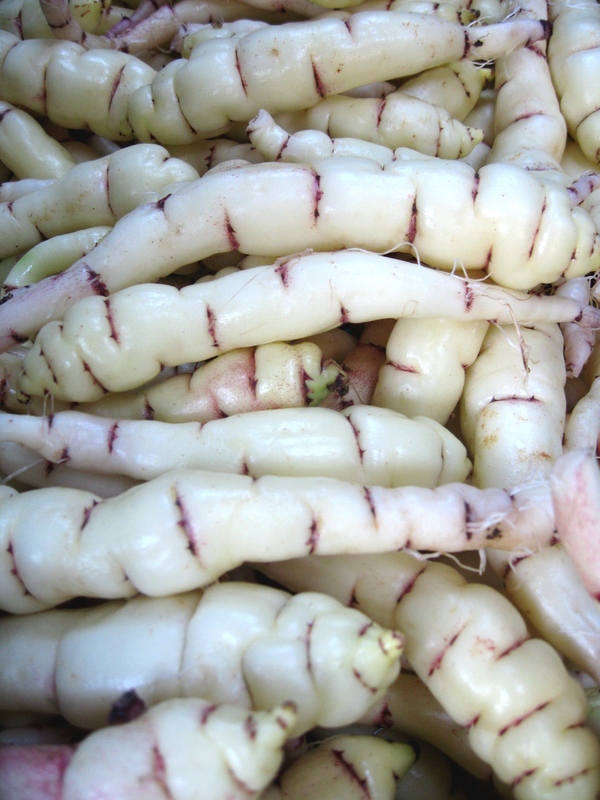 And, thanks to the weather, fertile soils, incredibly hard work, and probably some great karma, this year’s Peace Seedlings Andean root crop harvest has been the most prolific yet. our daily diets crops whose niches are currently monopolized by a single plant—think potatoes, tomatoes, and grains including common corn. 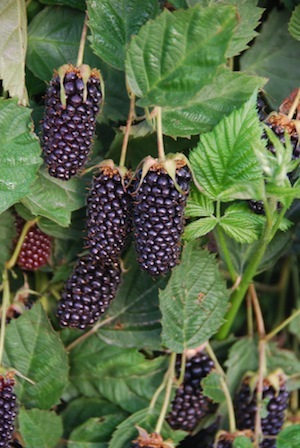 Often these unusual crops boast unique and alluring flavors, gorgeous colors, and distinct nutritional profiles. 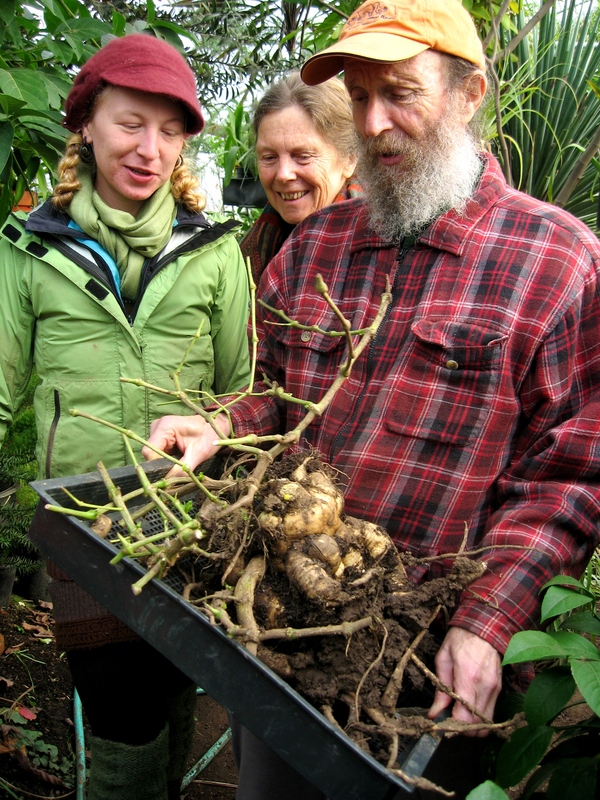 Yacon crowns to be planted next season. The yacon tuber visually resembles a potato or yam, but its texture and taste is entirely its own—plus you can eat it raw. Linda Kapuler compares the crunch of a yacon to a water chestnut, but juicier and sweeter. With its low levels of sugar, it’s an excellent choice for a sweet, nutritive snack. 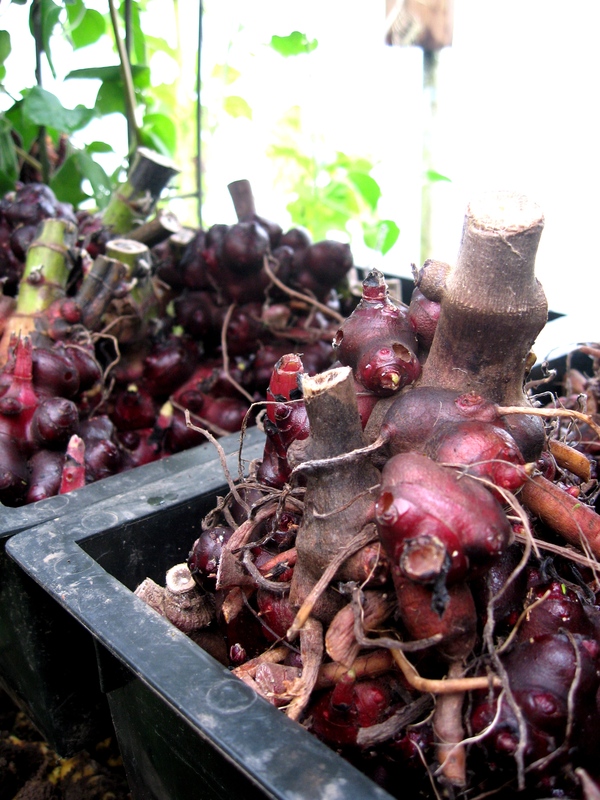 Stored properly, yacon crowns can be harvested each year and replanted. Peace Seedlings anticipates that these tubers will only grow in popularity, as they’ve been doing exponentially for the past five to ten years. 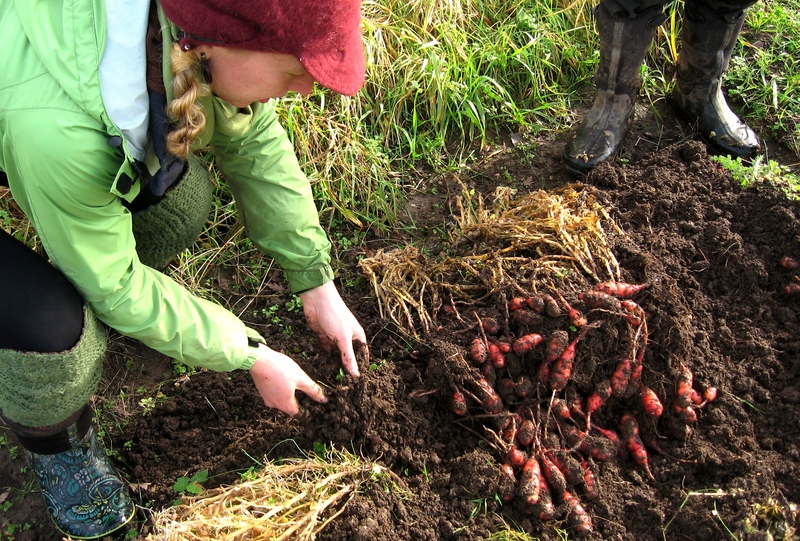 Mashua is another highly proliferative South American root crop (the tubers can comprise up to 75 percent of the plant’s dry weight) that grows without abandon in our Oregon climate. It also sports a beautiful—and edible—flower that you may recognize: mashua is in fact a tuberous-rooted nasturtium. 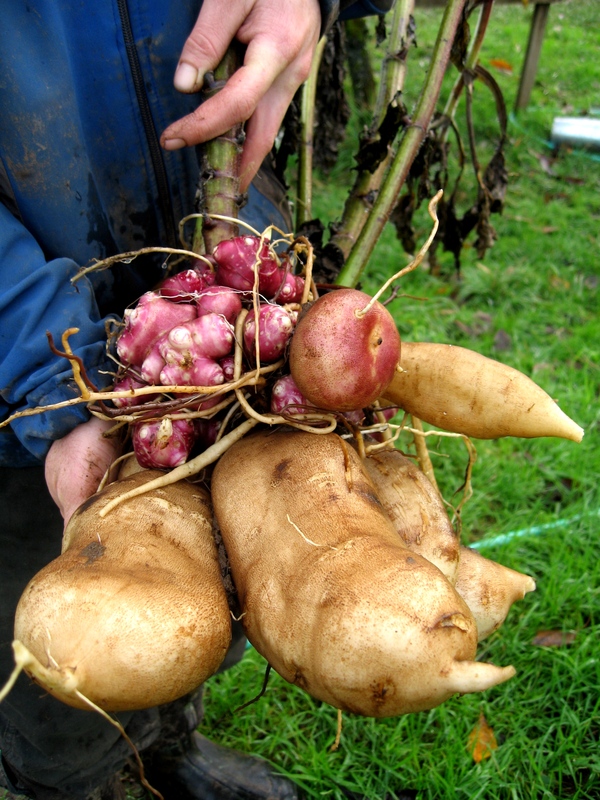 While many of the Andean root crops seem relatively impervious to Oregon’s potato-related pests and diseases (mashua, like wasabi and horseradish, contains pest-resisting isothiocyanates), some have not escaped the notice of gophers and other root-loving garden critters. So how does Peace Seedlings produce such a beautiful, blemish-free harvest? 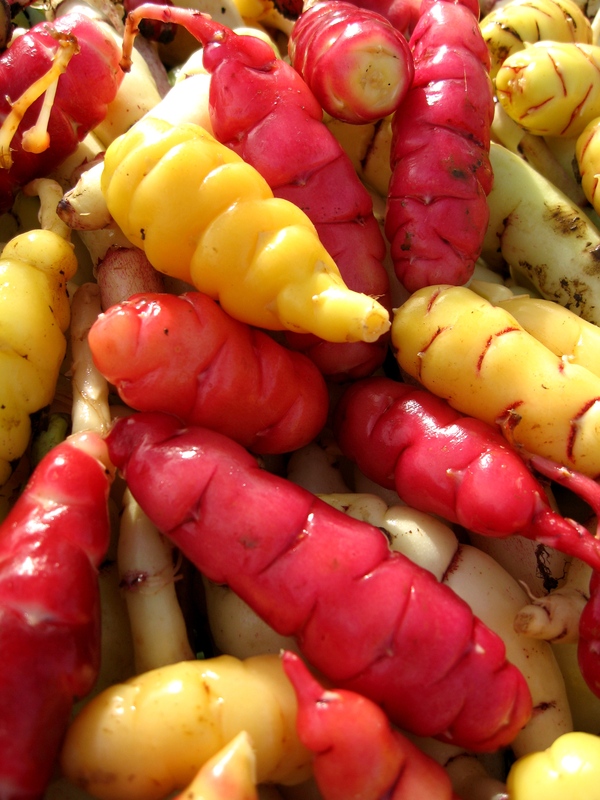 A staple in Peruvian and Bolivian diets, oca tubers grow in a stunning diversity of colors, and, like other Andean root crops, they grow prolifically in the Willamette Valley’s ecosystem. “They’re smaller, but they definitely put off more tubers than a potato, and this has been one of our best growing seasons for them,” said DiBenedetto, as he and Dylana Kapuler unearthed an impressive mound of the tubers. But don’t dig them too early in the season—you can harvest oca tubers as late as November or early December. 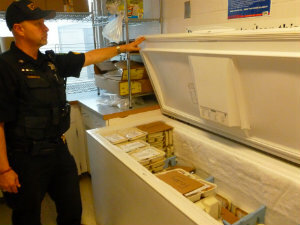 “They start tuberizing at the end of October or so, but they hold on until winter,” said DiBenedetto. Eaten raw, oca has a distinct crunchy texture that works great in salads—cooked, the tubers are soft like a potato. Oca also has a diversity of flavors from sweet to tangy, and it’s easier to prepare than a potato: eat it raw, boiled, or mashed, no peeling required. Mauka is certainly one of the most obscure of the Andean root crops, having only been “re-discovered” outside of Bolivia, Peru, and Ecuador in the 1960’s and 1970’s. 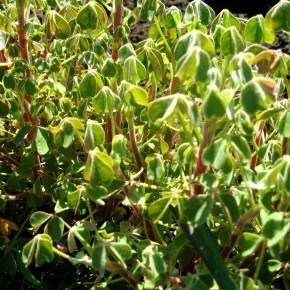 Most parts of this plant are edible—leaves (which can be cooked or eaten raw in salads), stems, and especially the roots. The roots are often described as a tasty mix between potatoes, parsnips, and sweet potatoes. 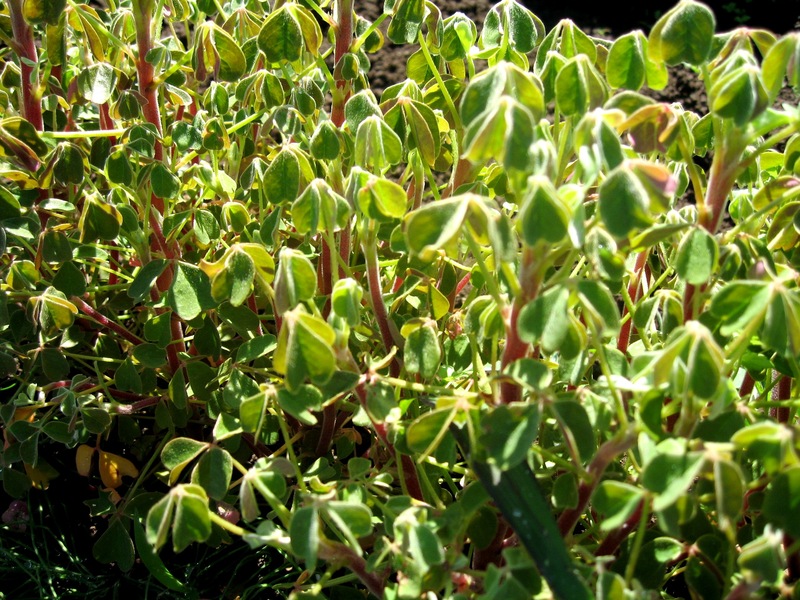 Perhaps best of all, mauka grows extraordinarily rapidly, with extensive root mass—as shown by the success of Peace Seedlings after only one year—and the plants themselves can grow over one meter in height within a season. An invaluable tome of Andean root crop knowledge, dive into Lost Crops of the Incas: Little-Known Plants of the Andes with Promise for Worldwide Cultivation (published by The National Academies Press in 1989) for more information. You can find Peace Seedlings’ yacon tubers at Corvallis’ First Alternative Co-op, and their yacon and oca at Sundance, Kiva, and The Corner Market in Eugene. 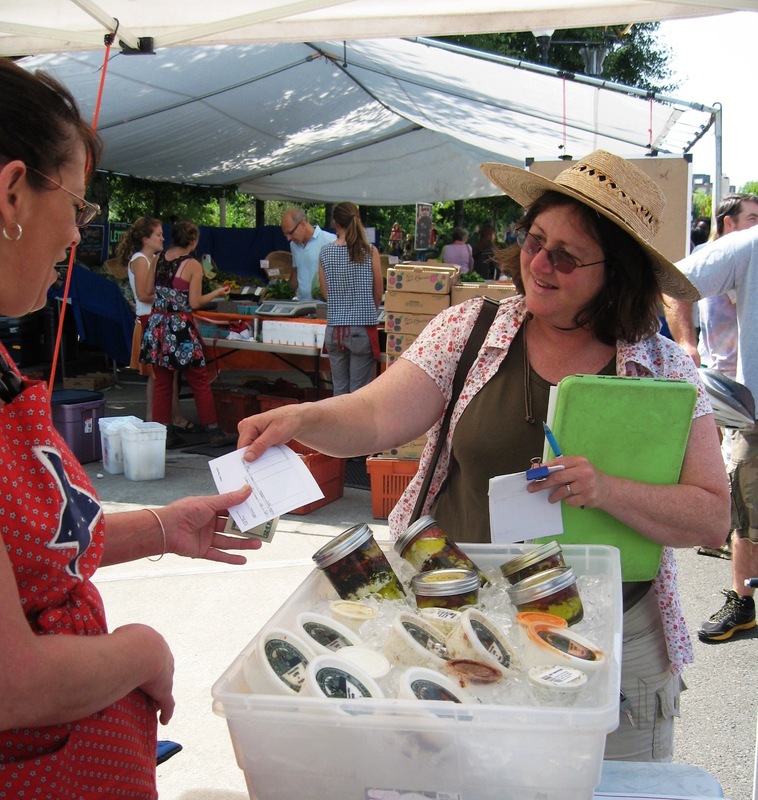 For a list of local organic seeds offered by Peace Seeds, visit http://peaceseedslive.blogspot.com. To grow your own Andean tubers, email peaceseedlings@yahoo.com, or call 541-752-0421. Previous ArticleCulture Fail: Let’s Plant Giant Invasive Flammable Reeds in Oregon! Most interesting article. Dr Kapuler and his children are doing a fantastic job of unearthing and popularizing these rare gems.